We said that we won't do it. We had all the valid reason as to why we are not doing it. Yet... Smarty is most likely be skipping a grade this year - going directly from her cozy little world of elementary school into 6th grade of middle school. Here is why. I started to write this post several times. My struggle to write it reflects the internal struggle I feel about this opportunity to skip a grade, a struggle that is so strong that I wake up in the middle of the night every night for the past few weeks asking myself over and over whether this is the right path for our family and our daughter. Why Are We Considering a Grade Skip? Smarty has always been ahead academically, but she was overall content in the classroom. The main reason of her contentment was the fact that she was part of a a sizeable "challenge group", aka "gifted cluster". These kids were getting their own assignments and were able to bounce their ideas off each other and grow together. Sadly, next year this group is disappearing. So we had to think how to keep Smarty challenged in this new situation. As a minimum, we wanted a full grade acceleration in math, but that would entail for Smarty to be in two schools at once, going to a neighboring middle school for math and coming back for other subjects. She was horrified by the idea and argued convincingly that this approach will make her really different and that she is unlikely to make new friends while being torn between two schools and having to manage transitions. She was a lot more interested in a full grade acceleration. Part of me is proud. Smarty has strong academic gifts and she is a confident test taker that is able to demonstrate her mastery of subjects. As part of this quest to acceleration, she took a test designed for an entry to an accelerated math program of 6th grade and passed it with flying colors. The teacher who graded the test has written that not only she knows the material but she is also able to logically explain her thinking - something that we had certain doubts about. Her current teacher praised her cheerful attitude and her ability to focus on tasks at hand. Part of me is scared. Smarty is already young, since she started kindergarten before she turned 5. She is also tiny - only 5% in height for her age. She does not have the same interests as most of her grade mates, especially girls. How will she fare with kids who will now be 2 years her seniors, especially when she enters high school before she even turns 13? Part of me is sad. Smarty will miss a lot of things by skipping a grade - a special overnight camp all 5th graders of our school go to every year, her elementary school graduation, her chance to be in a district cadet band next year. I am also sad about possibly giving up an entire year with my only child at home if she chooses to leave for college right after high school graduation at 16. Part of me is angry. I wish we did not have to do this. I wish our district had more options for gifted learners. I wish we had self-contained classrooms and curriculums designed for kids like Smarty. Well, we do not have any meaningful gifted program. We keep hearing for 5 years that the teachers can differentiate in the classroom, and most of our teachers did their best. I think Smarty was challenged enough in writing, she needs no real challenge from anyone in reading, but science and math subjects were source of frustration for our little fountain head who desperately wants to work at her own pace and not to do what her class is doing. Part of me is self-conscious. I think that some of our friends will think that we are "pushing Smarty too hard" and that we are helicopter parents who want to direct her destiny. Luckily, our own family is fully supportive of this move. Part of me is grateful. We have a good school. Smarty was thriving here. She found her intellectual peers and she formed her first friendships. She became much better working in groups. 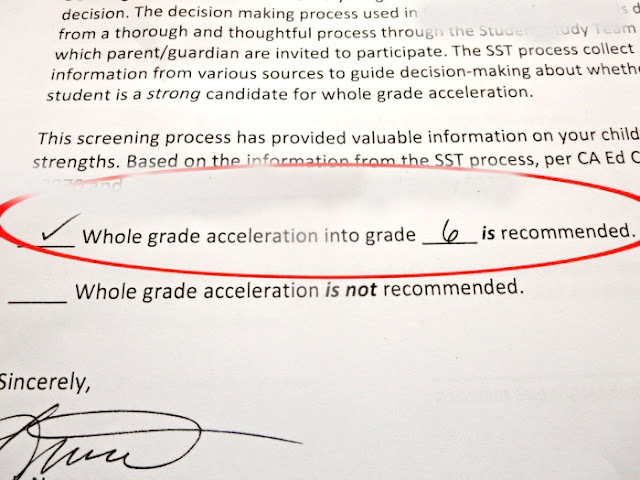 Our administration supported us in our request to consider a grade skip even though nobody was accelerated in our district in quite some time. Our former principal came to the meetings to support this request even without us asking for it. We are very lucky to have teachers and administrators willing to respond to our child's individual needs..
Part of me is hopeful. Yes, Smarty is going to be the youngest and the smallest, but she is already that way in her own grade anyway. We hope that she will start her 6th grade in a small brand-new STEAM school where all her friends are going for the fifth grade, so she can still hang out with them. She also has older friends in the 6th grade who are also going to this new school, so she will not be entering completely uncharted waters. The principal of this new school used to be our principal, and she cares deeply about her students in general and about Smarty in particular. I also hope that project-based approach of this new school will help our daughter to apply her academic talents to more complex problems and to become a more hands-on learner. In other words, I hope that my intuition is right and that we are making the right decision here. We are still waiting for the decision on Smarty's acceptance into the 6th grade of this new STEAM school. If this falls through, we will be facing another difficult choice - whether to keep her in 5th grade or send her to a big neighborhood middle school. So far the opinions are split on this one - I want to keep Smarty in the 5th grade, my husband and Smarty want to skip. Hopefully we will have the answer by the end of this week. 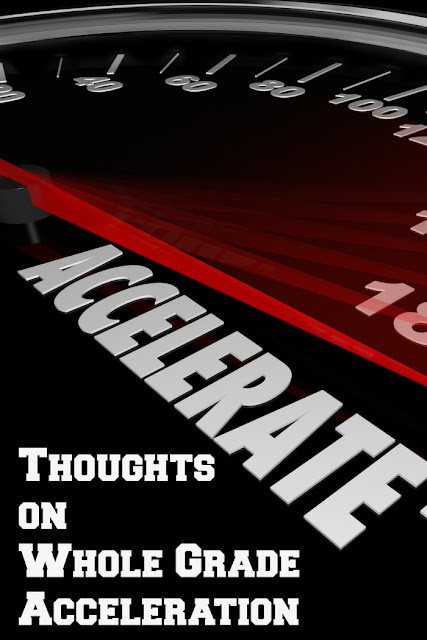 What are your thoughts on whole grade acceleration? How about trying the grade skip and if it doesn't work out, she can always come back to the comforts and security of 5th. It is a big transition to middle school so I can understand the trepidation. I've read cases where kids don't do well with grade skip but also know cases where it has been highly successful. K is also petite so I worry about this but she knows a 6th grader currently who is petite as well and is doing well in her grade. In the end, maturity probably matters more than size. Other option is to keep her in 5th so she can go to her graduation, camp, etc. and supplement like you have been doing. She can always grade skip later if she wants. It might be easier to grade skip after she has made the transition to middle school. Let her enjoy being a kid! It's a hard decision for sure. That is one thing I like about how we're homeschooling, we're able to mix and match according to actual abilities. I'll be praying she can get into the STEM school. Wow, that is a hard one. I wish I had some excellent advice - but I'm sure you'll do what's best for Smarty no matter which school, or grade she ends up in. What a tough decision! I think with this new school option, where her friends in 5th will be there and she already knows some 6th graders, she may be just fine. If she were going to a neighborhood school, I may have to agree with you and push to keep her in 5th, and then maybe skip 6th or 7th instead. We did the grade acceleration for math in 5th grade but he was able to do the 6th grade math course online so there was no need to leave the school. I will say that in 6th grade, the content gets a lot older a lot faster. For example, they watched CNN Student News Network and discussed many of the news stories, health class covered drugs, alcohol, etc. There's just a different atmosphere in middle and the kids are treated at an older level, if that makes sense. It's been fine and C was totally ready for that. But it's something to consider. Maybe look into the curriculum for the different classes in that school and see what you think.